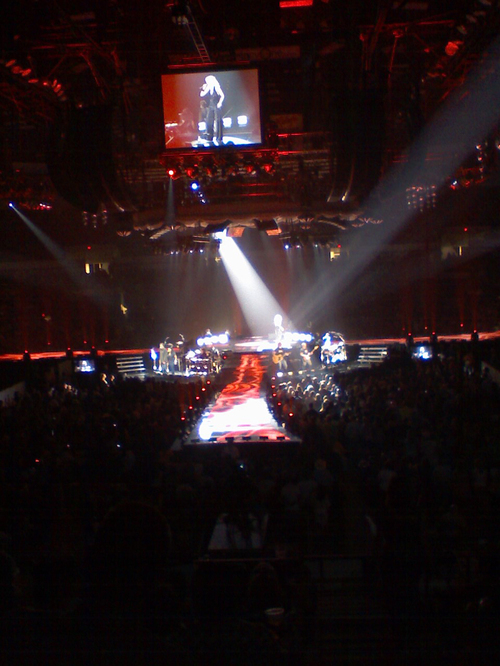 I was met by a Live Nation representative, and I was ready for the worst. 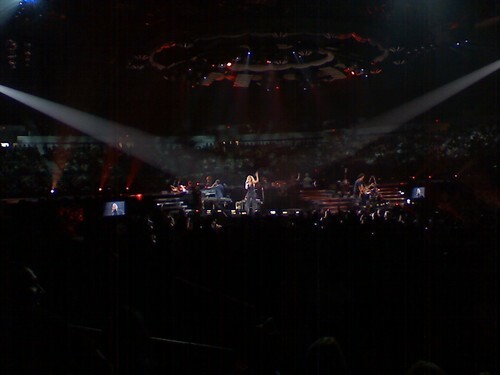 I was already told by email that I can shoot "Tim & Faith’s first song/no flash. Shoot locations will vary slightly in each venue, but positions must be mid-way up venue bowl so shots are taken shooting down on stage. 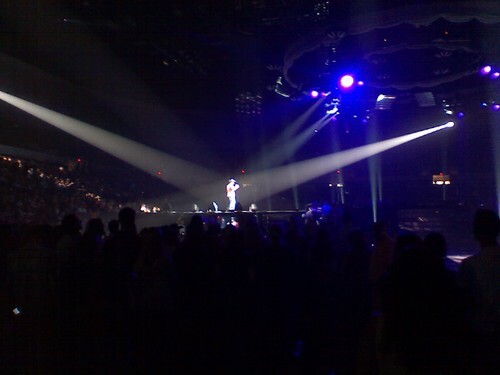 Location must be above shortest stage extensions, as this is where Tim & Faith will make their entrance. A LONG LENS is required. Shooting may commence as soon as song begins." Since I was shooting with a cell phone, the long lens art really cracked me up. I was not expecting much. I was led onto the venue floor and was told that instead of shooting from above the stage, I was told that I was going to be shooting from in front of the sound board which was at the far end of the longest stage extensions. I couldn't have been further away from where Faith and Tim would be starting the show. 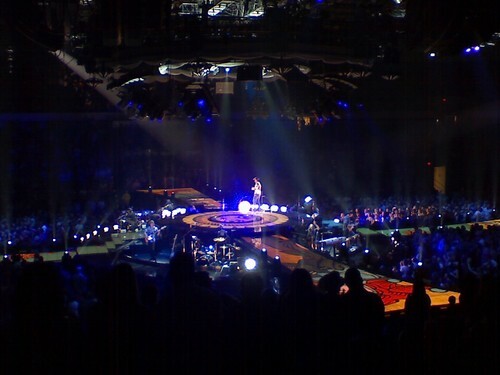 To explain the stage, it was a circle on the center of the venues floor with 4 "arms" sticking out, 2 short and 2 long. 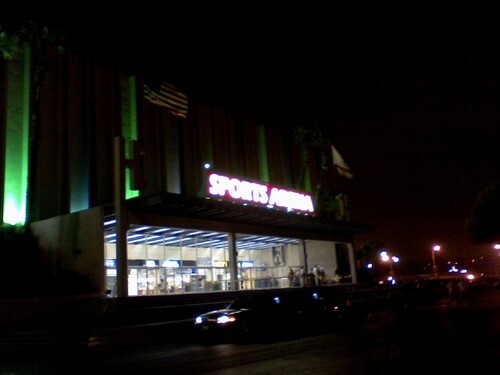 The house lights went down and Emerson Lake and Palmers song "Karn Evil 9: First Impression, Part 2" started to blast through the PA. For those who don't know , thats the one the goes "Welcome Back My Friends to the Show That Never Ends..." At the end of the song, Faith Hill was on stage to my far right. 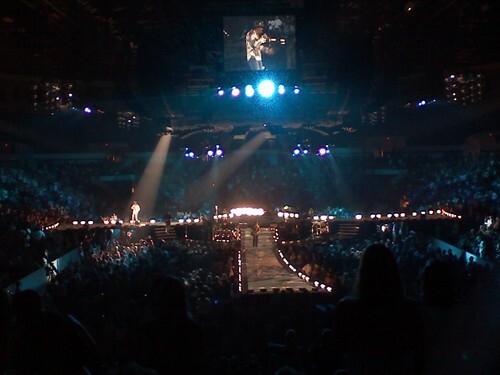 While singing a duet, Tim McGraw showed up on the left side of the stage. They then met at the middle of the stage. 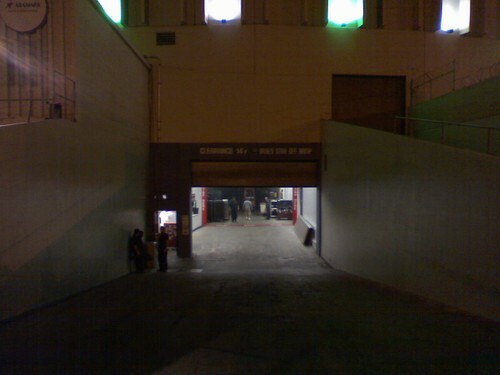 After the first song, I had to leave the venue, and I was escorted back out of the venue. I was given a ticket to the show, so after having to walk around to the door, I went down to my seat. The shooting angles from here were better than I had for the first song. Faith Hill was doing her set and seemed to have good rapport with the audience, and even stopping a few times to sign cowboy hats handed up by those close enough to the front. On a side note, Faith hasn't been having a great time recently. On the photography front, her cover to Redbook was criticized for excessive photo editing. It was interesting to be able to photograph her, but I was way too far away to even see what she looked like in person. Faith was also criticized by her reaction to a fan who grabbed the private parts of her husband on stage. 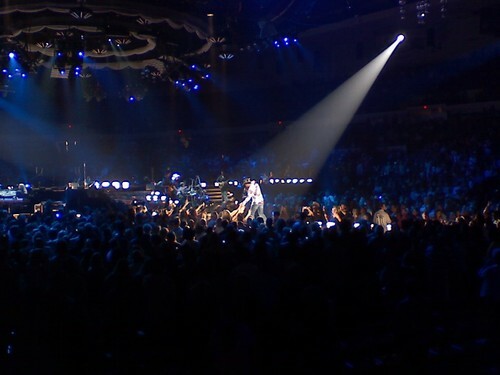 At tour stop in Lafayette, LA one fan got a little grabby with Tim McGraw, and Faith ain't havin' none o' that! "Somebody needs to teach you some class, my friend. You don't go grabbin' somebody else's -- somebody's husband's balls, you understand me? That's very disrespectful." At the same show, it seems that another fan tried to steal the ring off of Tim's finger while he was shaking hands with the fans. According to reports, the ring has been returned. 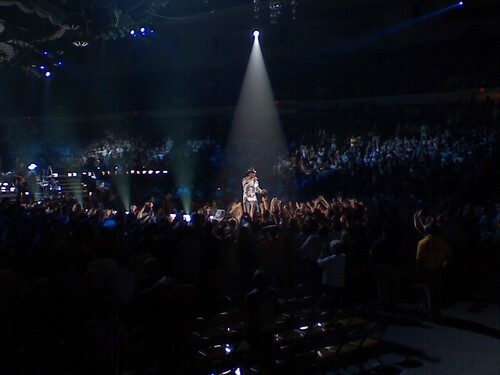 With out a break, Faith finishes and the stage goes dark. 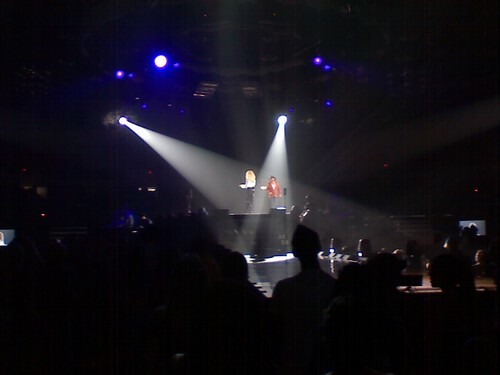 When the lights come back up, Faith and Tim are sitting back to back in the center of the stage with a thin white material surrounding them. 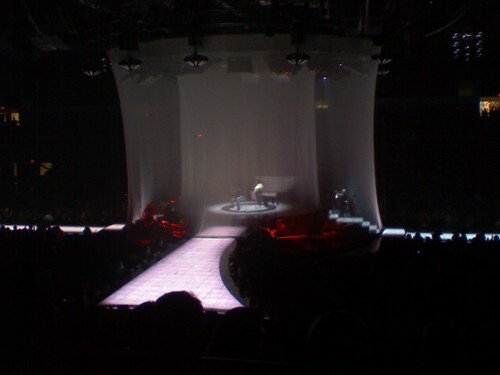 As they start to sing, red lights start to run slowly down the material. To me it looked like blood, then turns into a solid red. 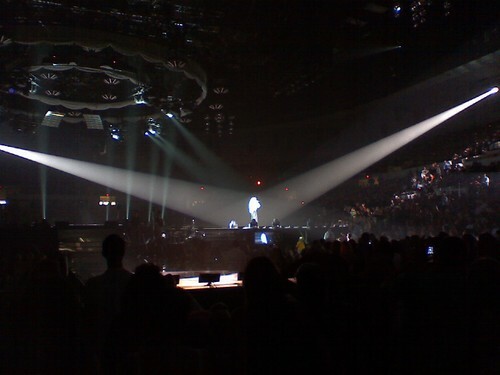 After the duet, Faith leaves the stage and it is time for Tim. I finally heard my first repeat song of the summer, Steve Millers "The Joker". A great tune sung really well by Tim. It was time for this blogger to stop taking notes and just kick back and enjoy the rest of the show. On yet another side note, it seems like car manufacturers are heavily into the music business. 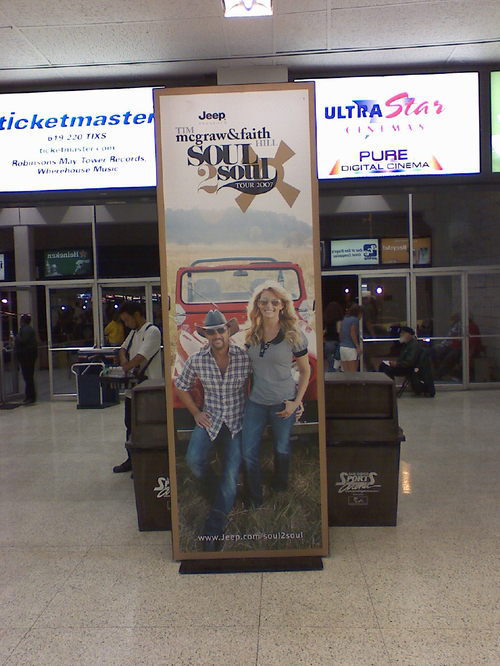 The venue that I shot Blues Traveler and Ratdog and Dickey Betts is sponsored by Lexus and the whole McGraw / Hill Soul2Soul tour is sponsored by Jeep. So while this show wasn't exactly "The Front Row Is Never Close Enough", and the only shoot one song was a waste of time (they let the audience bring in point and shoot cameras) the corporate representative was great, and it was good to be back in the Sports Arena again. Love the way you captured the lighting. And as alwasys a grate story to make it complete. 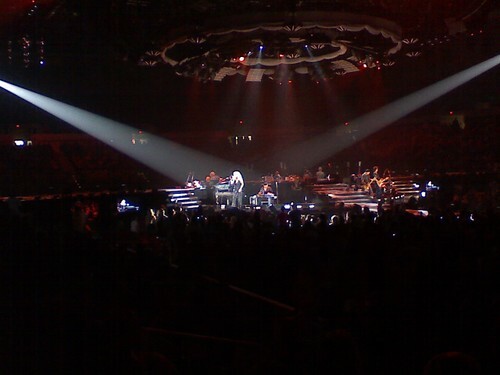 Wow, they did not give you much to work with being that far back but it looks like Faith and Tm spend some bucks on their show.....The "blood red" lighting is very cool....nice work Alan. Your an amazing photograher to take good pic's with a tiny phone from soooo far away. I gotta say my favorite pic and story though is of the backstage door...oh, how many concerts were spent hanging around there in my youth! A great man .Thank you for your post.